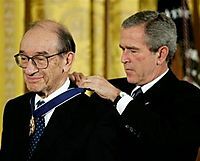 Alan Greenspan was appointed Chairman of the Board in August of 1987. For the next 19 years he ruled the board. He was listened to and touted the high guru of the American economy. The 80’s and 90’s were a period of prosperity and a boom economy. Everything seemed to be working. Greenspan stepped down in 2005 and Ben Bernanke took over the helm, appointed by President George W. Bush. Then in 2008, came the Sub-prime mortgage collapse, and then followed a national economic meltdown and that was followed by a global financial crisis. Now I am seeing that if I don’t understand or follow what the “experts” are saying, maybe it isn’t that I am stupid or uneducated, but rather that these “experts” actually DON’T KNOW WHAT THEY ARE TALKING ABOUT, and are “talking through their hats” or “through the sides of their mouths.” Perhaps they are in a make-believe world of their own manufacture, and their specialized jargon and idiosyncrasies are just masks or false fronts designed to mislead, and put up a fascade of confidence. Does it look like the new head of the Federal Reserve, Mr. Bernanke, is praying? Perhaps we no longer should put the power in a single person or group to set the “interest rates” like some Gods standing on Mount Olympus. Maybe we need to get rid of this facet of “big government” and limit governments role to one of legislation and enforcement of anti-fraud laws and the prevention of unfair business practices. Maybe what is healthier for the economy is to allow the consumer to choose and let a social Darwinism of natural selection set the interest rates. The only people who seem to be real experts on the economy are the ones who have been successful in business and amassed their fortunes by learning how to navigate the currents of commerce and industry. Maybe we should let businesses run themselves, and only let the government monitor and enforce the laws against crime, unethical practices, and fraud. Since writting this blog 2 years ago I watched the HBO special film TOO BIG TO FAIL. If there is any truth to what was presented in this film I no longer see that successful businesses are safe to run without regulation. In my opinion, GREED, ultimately will lead to calamity. Someone needs to be watching over it all, and someone needs to be watching over the watchmen.